The National Highway Traffic Safety Administration has opened a preliminary investigation into 42,875 model year 2008-2009 Fortwo vehicles (“Smart Cars”). 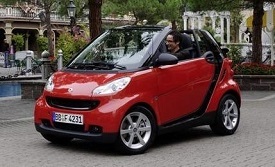 The term “Smart Car” refer to the Smart Fortwo originally introduced in Europe. They are small two seat vehicles with arguable underpowered engines. The Smart Car was developed as a partnership between Mercedes-Benz and Swiss watchmaker Swatch. The first American imports arrived stateside in 2007. The NHTSA investigation was opened due to eight complaints from consumers related to engine compartments located in the back of the vehicles catching fire. Below is an image of a 2008 Fortwo subject to the preliminary investigation. The complaints include fires that happened while being used and also parked. In six of the complaints owners relayed the vehicles filled with smoke, had a check engine light illuminate or heard unusual noises while driving. Two other incidents were detected after the vehicles were stopped. The vehicles were seven to eight years old with five taking place in 2015 and three in October of 2016. One complaint from a 2008 Fortwo user indicated smoke came out of the dashboard. Her son was able to get out and run to call 911. While calling he heard the car explode with the entire car burning. A link to the full NHTSA preliminary evaluation notice is here.